Pictured are Rural Development Chairman Joe Brady, IFA Economist Edel Kelly, IFA President Joe Healy & IFA Farm Business Chairman Martin Stapleton. 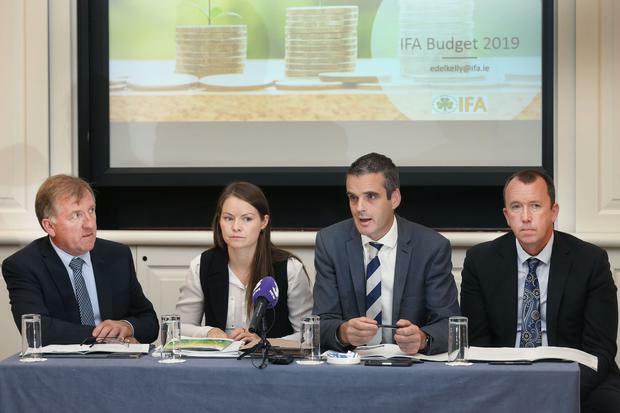 IFA president Joe Healy has said the fact that the low cost loan scheme announced in last year’s budget still hasn’t been rolled out is “farcical”. Speaking at the organisation’s pre budget submission launch, Mr Healy said it’s imperative that the scheme is introduced to help farmers weather the storm of current unprecedented and long term challenges to the sector. IFA economist Edel Kelly highlighted how this was one of the toughest years on Irish farms not just due to the weather but due to policy and political uncertainty of CAP and Brexit. “This was probably one of the toughest years on Irish farms. This year highlights that the ongoing uncertainty of Brexit and weather events are putting increased pressure on farmers,” said Ms Kelly. The organisation also renewed its call for a targeted €200 per suckler cow payment and increased ANC funding of €73m to reverse cuts since 2009 and restore the value of payments.